Albrecht (Albert) V, Duke of Bavaria from 1550 to 1579, was born 29 February 1528, son of Wilhelm IV, Duke of Bavaria (1493-1550) and Jakobaea of Baden (1507-1580). He succeeded his father as duke upon his father's death in 1550. Albrecht married Anna of Austria (1528-1590), daughter of Ferdinand I, Holy Roman Emperor. Albrecht died 24 October 1579 and was succeeded by his son Wilhelm V (1548-1626). Albrecht was in many regards similar to his brother-in-law, Emperor Maximilian II, namely, mildly tolerant to the rising tide of the Lutheran Reformation. He was at first indifferent to religious questions, primarily interested in the arts and sciences. In 1556 he permitted the communion with both emblems (Lutheran) and ordered an investigation of conditions in the Catholic Church (a report of 1558 revealed everywhere gross immorality among the clergy). Naturally, such conditions were relatively favorable for the spread of Anabaptism; the peace, however, was but of short duration. Already in 1556, his father-in-law Ferdinand I, the most powerful opponent of the Anabaptists, induced the duke to call in the newly-created order of the Jesuits, who in a short time caused him to change his mind. The aggressive Counter Reformation set in. Stern orders were issued to ferret out Anabaptists, and to eradicate this "sect" with all means wherever found. Thus in the city of Burghausen several Anabaptist martyrs are reported before 1559. The most notable case of persecution, however, is that of the outstanding Hutterite missionary Claus Felbinger, who together with his brother-companion was executed in Landshut in 1560, in spite of a most brilliant defense. Unfortunately research on this period is sadly lacking, and the sources have not yet been published that would give a clearer picture of Anabaptist life in Bavaria in the second half of the sixteenth century. The movement seems to have been less strong than in adjacent Württemberg. In both countries the Hutterites were diligently working as missionaries for their brotherhood. Duke Wilhelm V, the successor of Albrecht, stated in a mandate of 1586 that six hundred Anabaptists had left the country, apparently for Moravia. When Albrecht V died in 1579, Bavaria had become another stronghold of Catholicism like Austria, and Anabaptism seems to have been waning. Krehbiel, Albert, Robert Friedmann and Richard D. Thiessen. "Albrecht V, Duke of Bavaria (1528-1579)." Global Anabaptist Mennonite Encyclopedia Online. December 2007. Web. 26 Apr 2019. http://gameo.org/index.php?title=Albrecht_V,_Duke_of_Bavaria_(1528-1579)&oldid=144684. Krehbiel, Albert, Robert Friedmann and Richard D. Thiessen. (December 2007). 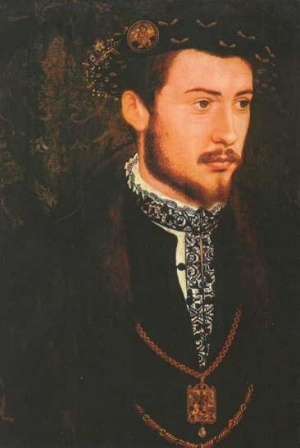 Albrecht V, Duke of Bavaria (1528-1579). Global Anabaptist Mennonite Encyclopedia Online. Retrieved 26 April 2019, from http://gameo.org/index.php?title=Albrecht_V,_Duke_of_Bavaria_(1528-1579)&oldid=144684. Adapted by permission of Herald Press, Harrisonburg, Virginia, from Mennonite Encyclopedia, Vol. 1, p. 35. All rights reserved.